The essential purpose of NING monetization platform is to enable network creators to make money from their content. 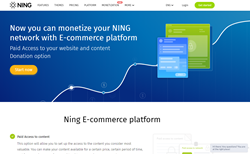 Hot news for all who have been looking forward to the opportunity of making money online in 2018: NING, U.S.-based software company, has officially launched an advanced monetization platform for its community website builder https://www.ning.com/monetization/. The feature rollout has been contemplated by internet enthusiasts for quite a long time now, and finally, it’s out and ready to show what it’s worth! But first things first, a couple of words about NING in general. The company has been up and running in the market for over 10 years. Its brainchild is a versatile and user-friendly SaaS platform allowing users to build customizable websites for their online communities. The networks created on NING are many and cover a broad range of topics and niches, e.g. soccer team fan clubs, hobby communities, life coaching networks, closed business societies, etc. The platform has gone through a lengthy cycle of evolution which made it a unique product within its market segment. To make an even greater difference for its customers, NING has set out to develop comprehensive tools that would allow users to monetize their online communities with little to no efforts. The idea was successfully brought to life in the early summer of 2018. The feature, which was made available in beta for a couple of months prior to the official release, has been eagerly anticipated by content creators from all walks of life, ranging from bloggers who used to share their insights online with a close circle of friends to powerful internet influencers with thousands of followers on social networks. Paid Access: The feature that basically allows one to sell specific content on the website. It works pretty simple: create content people would like to have access to, set up a paywall, set your price, and be fairly rewarded for sharing your intellectual property. The Paid Access feature is perfect for selling online lessons and lectures, training videos, as well as other kinds of premium content and digital goods. Paid Membership: This option is designed to give users an opportunity to monetize the whole network and its online assets. Access is only provided to members who opt to pay a subscription fee on a regular basis. Paid Membership is intended to find a particular appeal among celebrities, popular authors of online video shows or podcasts, business consultants, etc. allowing them to earn money from fans or customers who would like to benefit from exclusive content (e.g. behind-the-scenes videos, personal blog or business insights) and chance for personal communication. Donations: The option for charity organizations and those who don’t wish to sell anything in particular but would rather fall back on voluntary support from network members. The feature allows users to run fundraisers and use the money for any relevant purpose. The bottom line is, unless you had a chance to explore NING over these 10 years, now is really the best time to do it. And even if you have already experienced NING at some point before, don’t miss out on it now. The company, as well as its product, has drastically changed, evolved, and made lots of new achievements during the last years.